Electrify Your Life with an Electric Bike! Electric bikes (e-bikes) use a rechargeable battery and pedal assist. Get as much or as little exercise as you would like regardless of your age or physical stamina! E-Bikes may provide an incredible opportunity to get back on a bike again. With pedal assistance, e-bikes flatten the hills, make longer distances obtainable, and are easier on your joints. You'll want to ride your bike more than ever! Live a busy life? E-Bikes are a perfect counterpart for commuting to work, getting the groceries, and any short trips you may have taken with your car. Add panniers (bike bags attached to a bike rack) to easily carry gear - the pedal assist helps with the added weight. “I am a mid-twenties, active cyclist who is always on the go, and I own an e-bike! What!? Someone in their twenties who is fit? No way. Yes way! My partner and I absolutely LOVE our e-bikes for everyday life. We commute work, pick-up groceries, ride up the bike path for fun, have strapped a bar-stool on the side of the road to the rear rack, and almost entirely substitute the need to drive our vehicles during the work week. Increases exercise, decreases stress, and gives you more time outside. People who bike to work live longer than people who drive*. There is very little environmental impact and no greenhouse gas emissions. Instead of filling up on gas and using oil, just recharge the battery! We dare you to not SMILE when you cruise up a hill on an e-bike! Try out an e-bike at Skirack today! Not sure what e-bike is right for you? 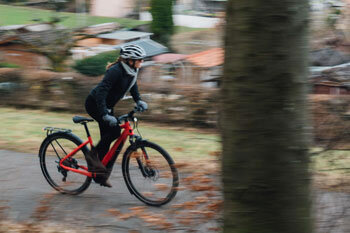 E-bikes models can differ on battery life, speed, size, and riding style. 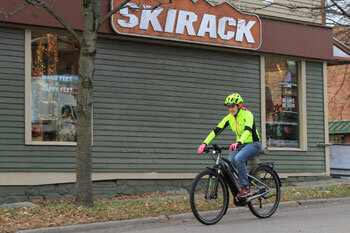 Stop by Skirack to discuss options with one of our e-bike specialists. 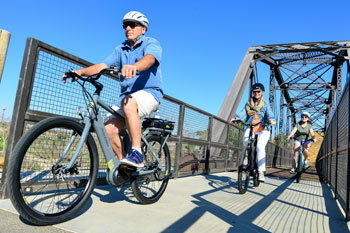 E-bike Models available and pricing (ask us about financing). Unsure about getting an e-bike? Try one for FREE with our new e-bike lending program (must be a Vermont resident).